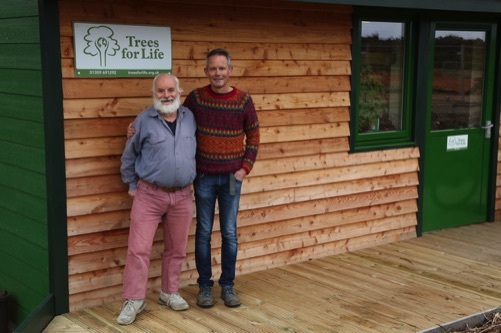 Thirty years after founding award-winning charity Trees for Life, acclaimed conservationist Alan Watson Featherstone this week stepped down as the organisation's Executive Director to take up a new role as Founder and Visionary, with Steve Micklewright becoming new Chief Executive Officer. In his new role, Alan will have a focus on Trees for Life's expanding conservation and forest restoration work, as well as liaison with its key partners and donors, and will continue to be the public face of the charity. While no longer responsible for the daily running of the organisation he founded, Alan will remain fully engaged with its work and will stay on its board of directors. Steve has worked in nature conservation for over 25 years, most recently as Director of BirdLife Malta and previously for organisations including the Wildlife Trusts, WWF and CPRE (Campaign for the Protection of Rural England). He has placed a strong focus on the benefits of nature for the health and wellbeing of people throughout his career, and has worked on many forestry and woodland conservation projects. Trees for Life's story began in 1986 when Alan Watson Featherstone made a commitment during an environmental conference in Findhorn to launch a Caledonian Forest restoration project. Practical activity began in 1989, with tree guards used to protect Scots pine seedlings in Glen Cannich from being eaten by deer. In 1991, volunteers began planting some of the first new trees to grow in the forest for 200 years. Trees for Life has since grown into a multi award-winning, leading conservation volunteering charity, with a dedicated staff team and thousands of supporters and volunteers. Its volunteers have helped to plant more than one million trees at dozens of locations, and the charity has pledged to establish one million more trees by planting and natural regeneration by 2018. In 2008, it bought Dundreggan Conservation Estate, a 10,000-acre site and biodiversity hotspot in Glenmoriston to the west of Loch Ness. Alan has won numerous awards for his work. Most recently, at the end of 2015 he was awarded an alternative New Year's honour by The Guardian newspaper in a celebration of the heroes of the year. Next week, Alan will continue his acclaimed series of lectures with well-known writer and author George Monbiot, with events at the University of Exeter on 14 January and at the University of Plymouth on 15 January. The sold-out Plymouth lecture will be available via live web streaming, with details at www.surveymonkey.co.uk/r/RewildingLiveStream. The lectures will highlight the benefits of rewilding – the restoration of damaged natural ecosystems, and the return of keystone species. People can support Trees for Life by becoming a member, carrying out conservation action, sponsoring trees for special occasions or sponsoring an acre of native forest. See www.treesforlife.org.uk.